The 12th CONFRASIE (Conférence régionale des Recteurs des Universités membres de l’Agence universitaire de la Francophonie en Asie-Pacifique), was held at Rangsit University, Thailand on April 4, 2017. At the invitation of AUF, the University of Danang (UD) nominated 4 members namely Assoc. Prof. Dr. Ngo Van Duong, Vice President of UD (Head of the Delegation); Prof.Dr. Le Kim Hung, Rector of University of Science and Technology – UD (DUT-UD); Assoc. Prof. Dr. Tran Dinh Khoi Nguyen, Vice Rector of University of Economics – UD and Dr. Hoang Dung, Vice Rector of College of Technology – UD to attend the conference. UD and its three members are members of AUF and CONFRASIE. 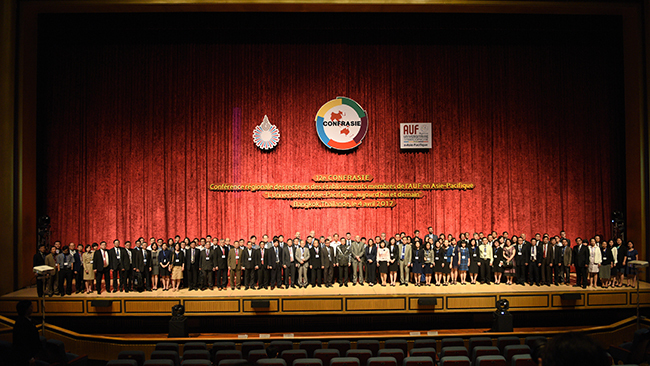 Hundreds of delegates of AUF’s member universities from Vietnam, Laos, Cambodia, China, South Korea, Mongolia, Nouvelle-Caledonian, Fidji and Thailand attended the 12th CONFRASIE with a topic of "Universities in Asia-Pacific: Today and Tomorrow" in which Vietnamese delegates were from 52 higher education institutions across the country. At the conference, University of South Korea and Diplomatic Academy of China were admitted to CONFRASIE with total of 85 members. At the plenary session, in the keynote address on the AUF Strategic Project 2017-2021, Jean-Paul de Gaudemar, General Director of AUF, emphasized the importance and key role of universities in the training of high quality human resources for businesses and organizations, especially in the period of global economic integration today. This requires universities to innovate, improve the quality of teaching, and take procedures to accredit the quality of higher education institutions and training programs to meet the realities of society. 06 sub-committees organized after the plenary session facilitated participants to exchange ideas, share experiences on the topic of the conference and related issues. This was also a chance for universities in the Asia-Pacific region to meet, exchange and strengthen cooperative relationships. The delegation of UD consistently participated in two sub-committees: "Training, research and challenges in quality management" (13:30 - 15:00) and "Governance and Strategic development plan in the context of economic and social fluctuations "(15g15-16g45). The University of Danang attended the 12th CONFRASIE with a bright spot on the quality accreditation and evaluation at institutional level as well as the training program level, when a National Center for Educational Quality Accreditation has been established and all four member universities have completed the quality accreditation and assessment with satisfactory results by national and/or international organizations. 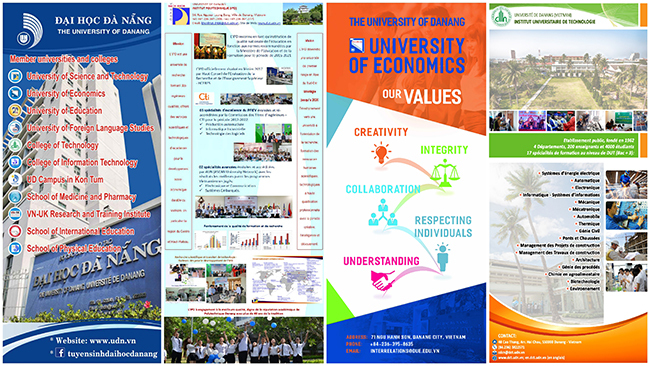 Only in 2017, DUT - UD has been accredited and evaluated the educational quality of institution as well as some training programs by the Center for Educational Quality Accreditation - The National University of Hanoi, AUN (Asean University Network) and HCRES (Haut Conseil de l'Études de la Recherche et l'Enseignement Supérieur). In response to the invitation of the 12th CONFRASIE Organizing Committee, DUT-UD made a presentation entitled "Higher Education Autonomy to Improve the Quality of Education and Research ", an issue that many delegates were keen on discussion and talk because it was not easy to implement and there were differences in conditions and practices in each country. DUT - UD also shared on the experience in educational quality accreditation and assessment at institution and training program level.